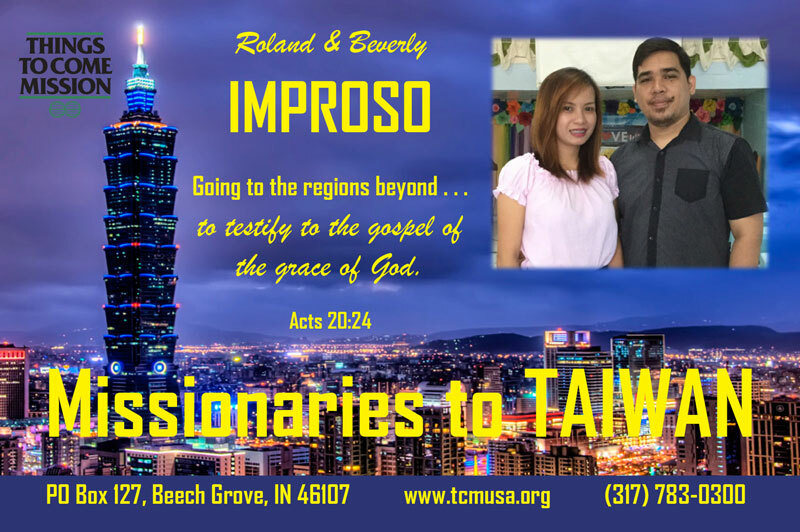 Roland and Beverly and the Quiñones family are the TCM Team targeting Taiwan. They will pioneer a new work there in 2019. Read the Improsos' recommendation letter by clicking on Newsletter in the right side bar. During our mission training at Grace Theological Center for Mission, we learned about the 20/40 window where most of the unreached people reside. Southeast Asia belongs to that window as well as East Asia. And since TCM has already started mission work in almost all of the countries in Southeast Asia, we thought that it would be best if we pray for a country strategically located in the 20/40 window in East Asia. There we found Taiwan, a country which is just a 2-hour flight from Manila. Taiwan is a highly developed country with a democratic form of government which allows its citizens to enjoy freedom of religion. It is dubbed as the Heart of Asia, a melting pot of eastern and western cultures. In keeping with the Troas Strategy whereby the Apostle Paul targets a metropolitan area in starting a ministry, we believe that Taiwan could be the gateway for the gospel to spread swiftly in East Asian region. Only about 4.5% of its population are nominal Christians. Indeed, it's a fertile ground to plant the seed of the gospel of the grace of God. Upon considering Taiwan as our target country, we found out that some of our Christian friends and acquaintances are already working there. We believe that God provided them to us as a bridge to the Taiwanese people they are working with. Our plan is to tap these believers so that through them we'll be able to get Taiwanese contacts. We also plan to train them on how to reach their Taiwanese friends with the gospel. Additionally, we are thinking of putting up a youth center nearby schools where students can hang out when they don't have any classes. The center will have indoor games, books and other amenities that will attract the youth. There they would be exposed to the Word of God through a daily sharing time. Hopefully, the various ministry ideas that we're thinking and those that God would impress on us in the future will help us achieve our ultimate goal to establish worshiping communities of Taiwanese people, who later on will be trained to lead various ministries of the church so that they would be able to reach their countrymen for Christ. While Taiwan is so close to our country, the Philippines, its culture is nevertheless very distinct from ours. To effectively reach the Taiwanese people we will have to learn to speak Chinese Mandarin and write with traditional Chinese characters. We will also need to learn to eat with chopsticks! These involve a great amount of work and dedication. By all means, we have to be like the Taiwanese people and be one of them so that at least some of them might be saved. Right now we're praying for open doors which will allow us to stay in Taiwan longer. We're considering various options like acquiring a student visa, working visa or religious visa. We believe that God will provide a way for us to be able to begin mission work in Taiwan the soonest possible time.